Y’all, it just so happens that, on my ONE-YEAR BLOGIVERSARY (this is a thing…I’ve been writing here for a whole year now! ), a little magazine was dropped into my mailbox, and the ridiculous targeted marketing people have somehow missed again. 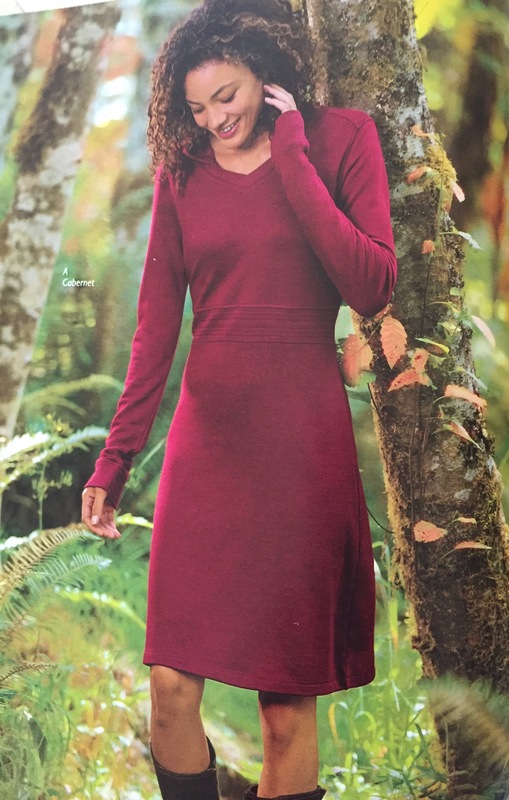 I’m not sure what they believe about my glamorous life here in Arkansas, but I’m not above making fun of some junk mail in the form of matching my SAHM lifestyle with outfits in the magazines. In fact, I’ve done it twice. Now, a giant outdoor retail outfitter has decided that it has me pegged. At the beginning of the magazine, I was on board. This is always what I look like on a hike. Hottie Backpack Girl: Who wouldn’t love to look like this, especially when you’re in the woods!? Except that instead of organic high-protein Clif bars, my backpack would contain a child who alternately cries to get down and won’t stop talking to enjoy nature. Bliss. The dress is fine, but it seems a bit out of place? Dress in the Woods Girl: Okay, so the dress is fine, but why is she wearing it in the woods? Was she at a wedding and got lost on the way to the port-a-potty, only to be rescued by a Cabela photographer? It’s safe to say that nowhere in my history have I ever worn a dress while walking through the woods (except at a wedding once). I was taking one of my kids to the potty. 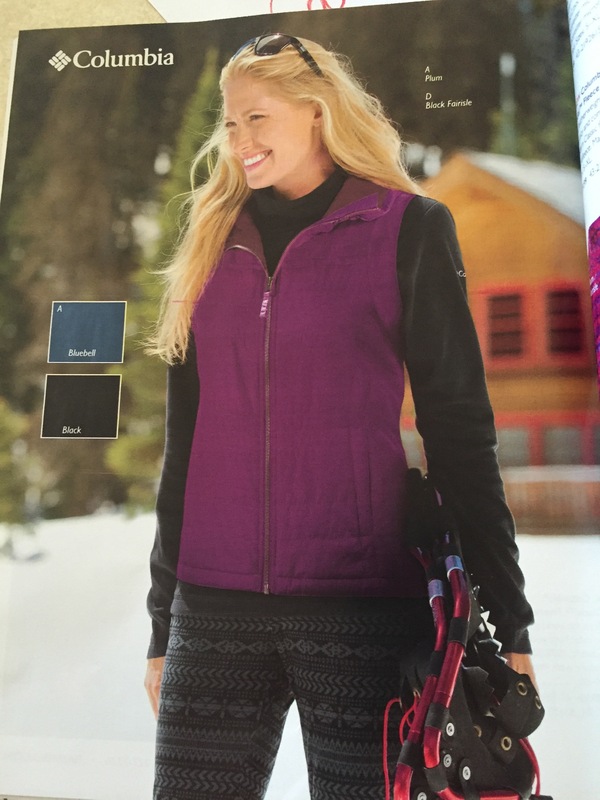 This is not how I look in snow pants. Snow Bunny: Rarely does it snow in my part of Arkansas. Usually we get ice and everyone freaks out and they shut down schools for three days because someone might slip. When it does get cold and I drag the kids outside to play in the ice, I don’t look like this. Where is her red nose? Where is the tissue sticking out of her pocket? Why doesn’t she have five mittens in the other pocket because the kids are tired of them? Why is all her hair not tucked safely into a toboggan? Up to this point in the magazine, I was on board. 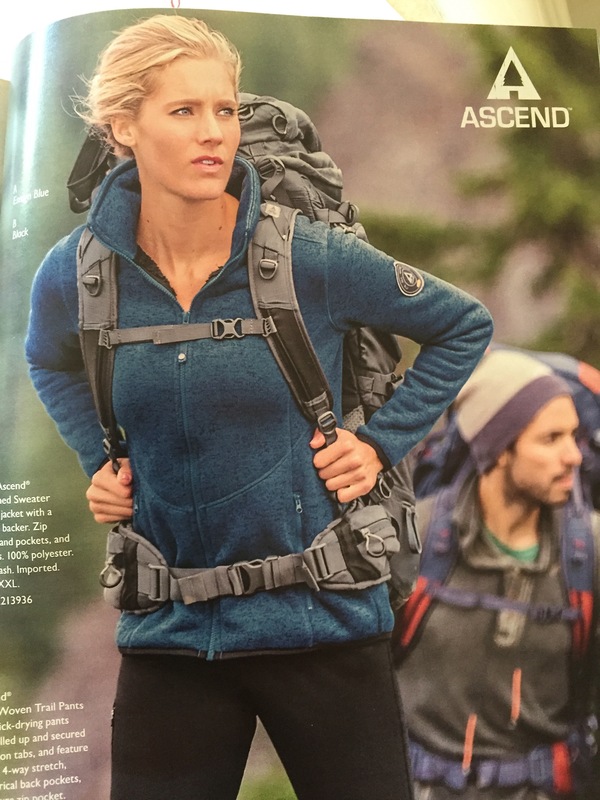 I would love to look like these women on hikes, or in the snow, or at a wedding in the woods. But then after a few more pages, it got kind of weird and not so Carrie. Um…I’m not even sure where to begin. 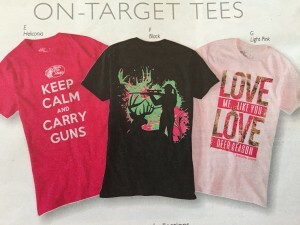 The Gun-Toting Tees: Who wouldn’t want a shirt that says, “Love me like you love deer season”? The sentiment seems whiny and sad, and I’m not sure that I want to advertise my marital disagreements regarding time spent at deer camp…on a t-shirt. 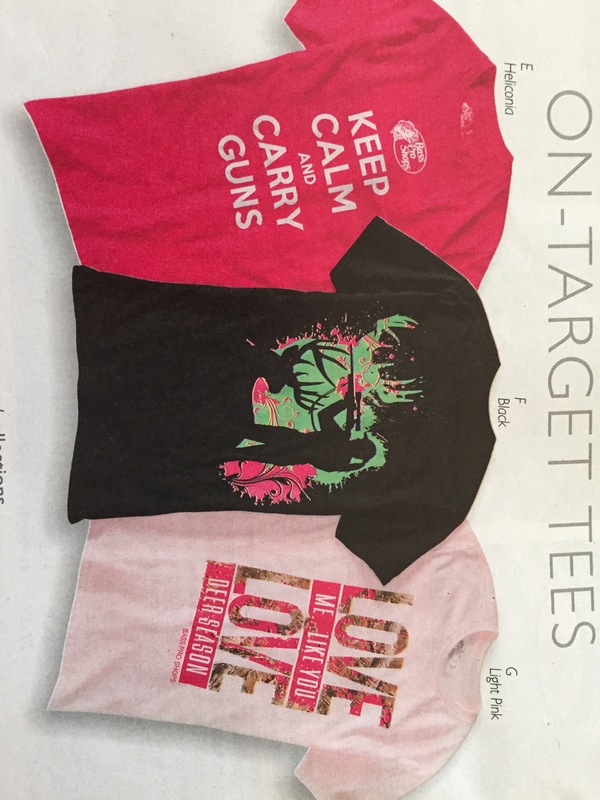 Maybe the “carry guns” shirt is for when he gets home from being at deer camp a little too long. Fair warning. 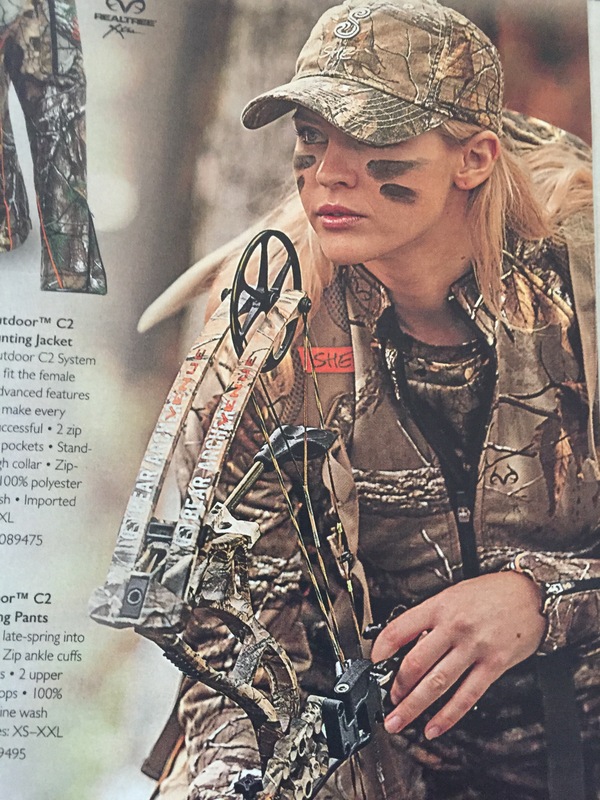 Bow Girl: This chick is stalking an animal with a bow and arrow. She looks like a total badass, but I could never pull this off. Like, ever. The most dangerous thing I’ve ever carried in the woods is a dirty diaper that had to go to the campground garbage can. Does this go with everything or nothing? The Camo Pink Purse: Do I take this to church or on my hunting trip? Hold on, Mr. Angry Mountain Lion. Let me get my gun out of my purse. You probably can’t see my purse because it’s camouflaged. I’m going to shoot at you now, so you’d better hope I miss. Have a blessed day. 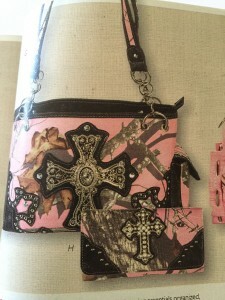 The Camo Nighties: Nothing says “Love me like you love deer season” more than RealTree lingerie. Welcome home from deer camp, honey. After a long day of 4am, sitting in the woods, wearing camo himself, and smelling like sweat and deer piss, the first thing he wants to see is more camo. Well played. Although if you’re ever locked out of the tent/cabin/deer camp in a particularly romantic moment, this is definitely your outfit. Maybe the targeted marketing people are getting a bit closer. I love the outdoors, and we try to get our kids outside and moving as often as we can. However, I’m drawing the line at being able to blend into the natural scenery while wearing negligee.